Walk into the Linnean House in winter and you will enter a world of brilliant color and delicate fragrance to delight the senses of the winter-weary visitor. 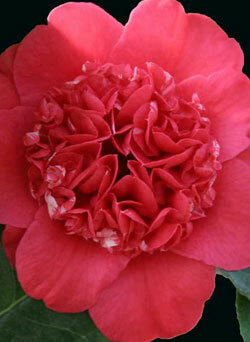 While some camellias flower as early as October, the main show begins in December and lasts through April. With 260 species and counting, camellias have been cultivated for over 2,000 years for their economic value. They are native to Southeast Asia, primarily southern China and Japan, although a few species are found in India, Malaysia, Borneo, and Korea. The seeds of some camellia species are crushed for their high-quality oil, which is used in cooking, cosmetics, and hairdressing, but the plant is probably best know as the source of tea. Most tea is made from Camellia sinensis. For black tea, the leaves are first crushed or rolled, then allowed to partially ferment, and then dry. Green tea comes from the same plant, but the leaves are not fermented. When tea was introduced in Europe in the early 17th century, it was strictly for the wealthy—a pound of tea cost the equivalent of a year’s salary. Today, tea is the world’s most popular beverage. Early botanist Carl Linnaeus (hence Linnean House) dubbed the plant “camellia” as a posthumous honor of a German Jesuit missionary to the Philippines, Georg Kamel, who died in Manilla in 1706. Kamel, whose name in Latin is Camellus, is thought never to have seen a camellia, but was well known for his work on oriental plants. Seeds of camellias first traveled to Europe from Asia on spice ships in the mid-18th century, when importers hoped to establish tea farms locally. While the flowers of the tea plant are not particularly showy, seeds of other camellia species were imported at the same time and soon became popular as ornamental plants, particularly the species C. japonica, C. reticulata, and C. sasanqua. Look in the Linnean House for the beautiful white flowers of one of the oldest cultivars, Camellia japonica ‘Alba Plena.’ The Garden’s specimen is over 60 years old. Camellias were brought to the United States from England in 1798 and were widely grown in conservatories in Philadelphia, Boston, and New York during the middle of the 19th century. Today they are popularly grown outdoors in the southeastern states (C. japonica is the state flower of Alabama) and along the west coast. While they were not considered winter hardy in St. Louis, a few recent “very cold hardy” cultivars have shown promise here, even in temperatures down to –10 degrees F. Camellias can also be grown in containers and moved indoors, but the plants must be kept below 55 degrees at night during the winter, as warmer night temperatures cause their buds to drop.